Does anyone have advice on wood or wood look top for bathroom vanity? I guess waterproofing is the big issue here? 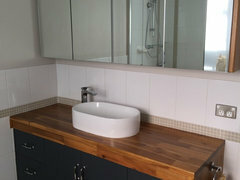 Wood warms up a bathroom in my opinion, but I am worried about its durability around water. It’s very popular & quite ok as long as you seal the wood with something like a Feast Watson marine grade timber polyurethane, especially the raw edges of the cutout for your semi recessed basin (will need silicone around here as well). wood look will save time spent refinishing in future. It was very trendy to have solid wood kitchen counters for a short time wear and water meant it was a short time. But 30 years later everything old is new again.